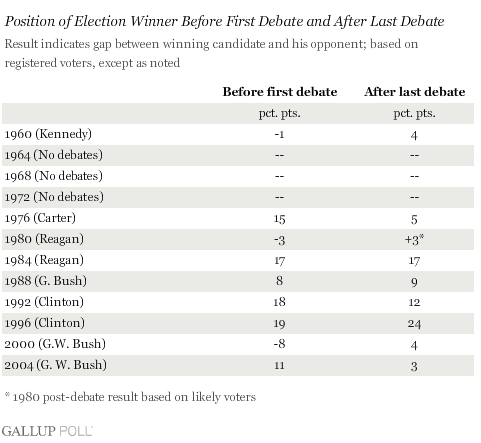 Consistent with other polls, Pew found that Romney was viewed as doing a better job in the debate by 72-20%. This included 78% of independents and even 45% of Democrats who thought Romney bested Obama. * As debate polls go, this is a rather significant drubbing; rarely do we see such a lop-sided verdict, particularly among the “loser’s” own partisan supporters. If the polls are to be believed, Romney’s debate “victory” has led to a significant tightening of the race, both nationally and in the critical swing states. For example, Gallup’s pre- and post-debate polls indicate that Romney has moved from a 5% deficit into a tie with Obama among registered voters. In the RealClearPolitics composite poll, we see a similar result, with Obama’s 3.1% lead on the day before the debate dwindling to .5% tonight. We see a similar effect in state-level polling in battleground states. In Michigan, the latest poll has Romney within 3% in a state considered out of reach just a week ago. Colorado, Florida and Virginia are now essentially dead heats, and Romney has moved within 3% of Obama in the critical state of Ohio, a state in which he trailed by nearly 6% before the debate. All this is a reminder of two points I have made repeatedly: first, national tides raise all of Romney’s state-based boats. Too often pundits view states as having their own unique constituencies. But the reality is that both candidates are fighting over the same type of undecided voters across all states, and if one candidate is able to win over these undecideds, it will boost his support across all the battleground states. We see precisely this effect occurring after the debate. Second – and in what some may view as a contradiction of my first point – we should not overestimate the impact of the first debate. I have been arguing for some time now that the state-level battleground polls will gradually align with the national tracking polls. At the same time, I have claimed that the economic fundamentals indicate that this will be a very close race (the mean prediction of the dozen or so political science forecast models has Obama winning slightly more than 50% of the two-party vote.) If the mean forecast model is correct, Obama will win by a far smaller margin than what the national tracking polls were saying for most of September. And if we factor in the uncertainty surrounding those forecasts, many political scientists believe this election is a dead heat. For that reason I was reasonably confident that the September polls indicating that Obama was running away with this race were overstating his support due, in part I believe, to how pollsters were constructing their likely voter screens. What Wednesday’s debate did, I suspect, is to impact Pew’s likely voter screen in ways that increased the number of Republican respondents they included in their final poll relative to Democrats. In other words, the debate didn’t switch votes so much as it increased Republicans’ enthusiasm for their candidate enough so that it affected Pew’s likely voter screen. As evidence, consider the gender gap. One of the more surprising findings from the Pew poll is that Romney has apparently drawn even with Obama among women. Last month, for reasons that I discussed in a recent Economist post, Obama led Romney among women by 18 points, 56%-38%. If the latest Pew poll is to be believed, Romney has now drawn even with the President with women, at 47%. Did he really erase Obama’s lead among women in less than a month? I suspect not. Instead, I think this is probably a function of how Pew constructed their sample after Wednesday’s debate. My bottom line is that Wednesday’s debate focused enough attention on the fundamentals to erase Obama’s polling lead which was largely based on his relative advantage in framing this race in a way that played to his strengths. But we shouldn’t overreact and buy into Pew’s results which indicate that Romney has now established a substantial lead. Instead, my read of the composite polls indicates that the race, as of today, stands almost exactly where I have been arguing it has stood for the last two months. Obama is ahead, but by the slimmest of margins. *An earlier version of this post had those numbers slightly off – I’ve corrected them here. The last two days are a reminder, as we head into tonight’s debate, how hard it is for either candidate to singlehandedly change the fundamentals, particularly the impact of the economy, that are driving this election. In my last post I suggested that McCain needed to issue an economic policy plan that appealed to middle-class voters in order to reframe the economy in a way that helped his campaign. He did just that on Tuesday by calling for a reduction in the highest tax rate on long-term capital gains from 15 percent to 7.5 percent in 2009 and 2010, and – in a bid to drum up support from senior citizens – he advocated lowering the tax rates on withdrawals from IRA and 401(k) accounts to 10 percent, the lowest rate, in 2008 and 2009 (this would apply to the first $50,000 withdrawn.) Early estimates are that this plan may cost more than $50 billion. This is on top of his earlier proposal to use some $300 billion of the $700 billion bailout money to buy up bad mortgages. The proposals are clearly directed toward lower-income middle class workers and retirees, two key voting blocs in swing states like Florida and Ohio that McCain must hold onto if he is to win this election. The problem, from McCain’s perspective, is that evidently Obama got the memo too! On Monday, he preempted McCain by issuing his own set of economic proposals targeting the very same voters. These included giving businesses that create new jobs tax breaks, freezing bank foreclosures and a limited government-funded public works loan program for state and local governments to rebuild the nation’s infrastructure. Obama also proposed suspending penalties on retirees who begin liquidating their 401(k)’s early if the stock market has bottomed out. Although there are significant differences in the two candidates’ economic proposals, one can understand if voters who look at the two plans do not move in significant numbers into one camp or the other. Both contain elements of an economic stimulus package, both target the middle-class and both seek to minimize hardship caused by home foreclosures and shrinking retirement nest eggs. Both, however, threaten to exacerbate the expected budget deficit by reducing tax revenues flowing into the government. Critics argue that Obama’s plan, with its estimated $60 billion price tag, threatens to throw his budget entirely out of whack and increase an already huge budget deficit. But McCain’s proposals also create a potential revenue shortfall. I will leave it to you to parse the details of the dueling economic policy proposals. I do not mean to dismiss their substantive significance. Instead, my broader point is to remind you why political scientists find little evidence of campaign effects, and why forecast models issued in August are often quite accurate. As we see this last week, one candidate’s attempt to frame issues in ways that benefit his election chances begat a counter effort via an opposing frame. These efforts often negate one another. It is important to remember this as we head into tonight’s final debate and the inevitable spin about what the candidates must accomplish. The odds are that, like the three previous debates, it will have little impact on either candidate’s standing among voters.